Sat, Apr 20, 2019, 20:21:38 ---- The fact: 42.844.000 visitors done. 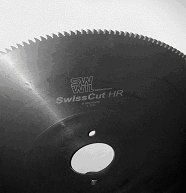 SW Wil, the technological market leader in Switzerland concerning sawing and cutting techniques has introduced a new worldwide standard by development of a friction saw blade called SwissCut HR. Due to a large investments, SW Wil is able to produce SwissCut HR blades in a very rationally way. Therefore the market price for the SwissCut HR is very competitive compared with that of standard friction saw blades. "SwissCut HR" friction saw blades at present are offered in dimensions of 400 up to 1200mm. Further technical details are published in the next future, see our homepage www.sw-wil.com.